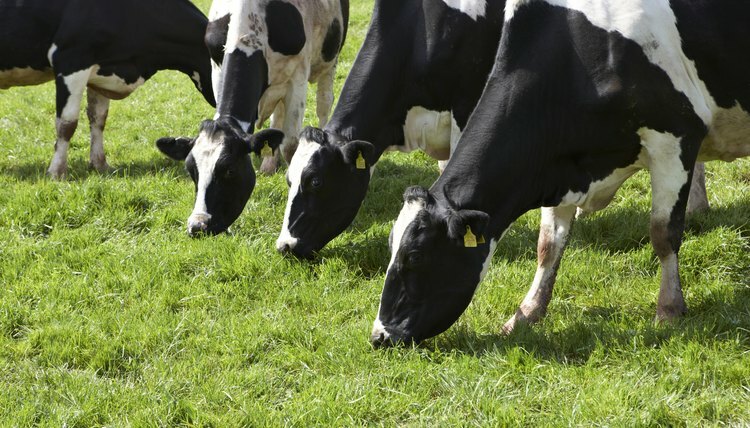 Often called enterotoxemia, overeating disease in cows arises when undigested carbohydrates stimulate the proliferation of bacteria (Clostridium perfringens type D) which produce harmful toxins in the cow’s intestines. This disorder typically occurs in well-fed cows and older calves, or those that suddenly consume excessive amounts of grain, a fact that accounts for the name “overeating disease.” Due to overeating disease's high mortality rate, you should protect your cows through a regular vaccination program; an initial set of vaccinations (followed by yearly boosters) stimulates their bodies to form antibodies that fight off the toxins produced by the Clostridium bacteria. Unfortunately, in the vast majority of cases, death is the only symptom of overeating disease in cattle. In many instances, you may feed your cows or calves in the morning and then go out to do your chores in the evening only to find one of them is dead. However, overeating disease can also strike after a cow or calf escapes and gets into the grain bin. Animals that have died from overeating disease won’t typically show other signs of illness, such as excessive weight loss. On the contrary, the healthiest cattle (particularly those who are growing vigorously) are the ones the disease is most likely to strike. If you have a cow that you think has died from overeating disease, you should make arrangements for your veterinarian to conduct an autopsy to verify that enterotoxemia is, in fact, the cause of death; a range of other health conditions can also cause sudden death in cattle, including poisoning and anaphylactic shock. Occasionally, some cattle suffering from overeating disease will show neurological signs of infection before they die. According to the Merck Veterinary Manual, cows and calves with rapid-onset neurological symptoms may demonstrate mania, convulsions and blindness. These symptoms will develop over the course of several hours before the cow dies. In rare instances, a cow or calf may develop a slower-onset infection and seem to go into a stupor or behave as if in a daze. This sub-acute infection often lasts for two to three days and, according to the Merck Veterinary Manual, the animal may recover. Cows suffering from overeating disease typically show certain internal signs of infection which veterinarians use to help identify the disease during an autopsy. Lesions (structural abnormalities) develop in your cow’s intestines as a result of the toxin that the Clostridium perfringens type D bacteria releases. Often the lesions spread to encompass the heart and abdominal muscles. According to Haynes, these lesions vary in severity depending upon how long the cow experienced symptoms. The kidneys of cows suffering from overeating disease may also reveal rapid decomposition following death, a characteristic sign of this disease.